Keeping the excitement and freshness alive in a marriage or long-term relationship is not easy for many couples. When the initial romantic attraction ends, couples start doing the same thing every day. Tedium and boredom replace the initial excitement when couples fail to make conscious efforts to rekindle the flame. Appreciating your past and the good times you had is good for your relationship. However, you should not focus too much on good memories and ignore the current disappointments and issues. Memories should help you see the qualities that you liked in each other and also inspire you to move forward. Be realistic about your past and accept that both of you and your relationship have changed over time. Make conscious efforts to kiss your partner passionately every day. Reintroduce the flirting techniques that worked for you before but have been ignored over time. Do not just say that you love your partner but show it through little things like keeping eye contact or holding hands. Besides, show your love during sexual encounters by being a bit naughty, cuddling, or any other technique that works for you. Chances are that you no longer look into your partner’s eyes and tell him or her your love and appreciation like you did before. As time goes on, many relationships are full of issues needed solving such as raising kids and paying bills. Although you need to solve those problems, you have to leave some time for expressing love and appreciation to each other. Appreciate little things that your partner does like balancing your checkbook or taking the trash out. Leave an appreciation note in your partner’s work bag or on the fridge. Think of your life without your partner to appreciate his or her presence sincerely. Revisiting old memories is not the best way of how to keep a relationship interesting. 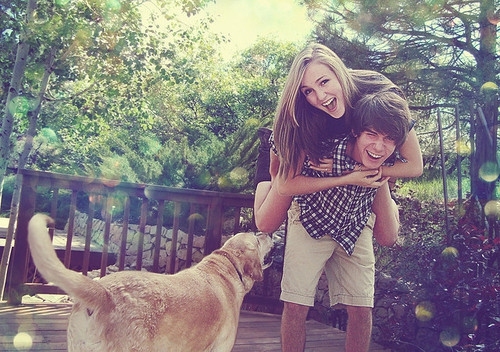 Creating new memories together to bring a sense of surprise and excitement in your relationship is. Do new things as a team such as skydiving, bowling, or taking a cooking class. Take turns in selecting new activities and stick to activities that both of you enjoy. Try new things in your bedroom as well. Surprise messages and notes remind your partner of your love. Any little change from your regular routine will keep your relationship fresh and interesting. Try the traditional surprises such as surprise dates, sending flowers, cleaning the house, or getting tickets to sold-out events. Every couple must make the decision about adding a new member to the picture. This could be a child or a pet, which both of you will love, be willing to take care of and value greatly. This is an effective way of how to keep a relationship interesting. Setting goals together fuels your ambitions and long-term relationship. Make a united decision on where you want to be in the long run and how you will accomplish your goals. Your long term goals can include dream jobs, neighborhood, kids or a dream house. Consult each other on how to accomplish the set goals. Set new goals when you accomplish past goals. Do not neglect your duty as a man to take her out on dates just because you have dated for a while. Do not go out to the same place you do every other day. Reserve a romantic and affordable place for your date. Make dates regular such as weekly or every two weeks as your budget and schedules allow. Giving gifts sends a message to your partner that you love and have been thinking about him or her. You do not have to buy an expensive gift. Just give something that you know your partner will like, like a new pair of sports shoes he wants or the dress she always talks about. Your partner may say the gifts are unnecessary but they are important and keep a long-term relationship interesting. Initiate an open dialogue with your spouse every day. Do not discuss daily chores in such dialogues. Take at least 15 minutes every day to talk freely about important issues such as work-related issues or the future of your relationship. Keep the conversations light and easy. Your goal in such dialogues should be to know your partner better and get closer to each other. Do not spend all the time together simply because you are in a relationship. You need personal friends and mutual friends. Spend more time with your friends and organize social events such as dinners, parties, and BBQs. You can also go for drinks as a group. Socializing with your friends will make your relationship fun and interesting. Planning an escape for the two of you is an excellent way of how to keep a relationship interesting. You can take a trip for two weeks or just one night in your favorite resort depending on your schedules. Treat the trip with your partner like a second honeymoon. If both of you are on tight schedules or cannot afford a trip, consider a picnic in the park or a drink in your favorite place. You must act and look the part if you want to keep a long-term relationship interesting and exciting. Make conscious efforts to look good for your partner. Exercise and eat healthy. Apply simple grooming tips like applying your makeup, shaving, waxing, and putting on a dress that makes you look attractive to your partner. Spending time away from each other gives you freedom to do your favorite things without your partner’s involvement or control. Allow your partner to go fishing with his friends for a day or go visit your parents alone. Spending time apart also gives you an opportunity to miss each other. You will notice a difference in your relationship when you get back together.